Cross-posted on Welcome to NCS-Tech! 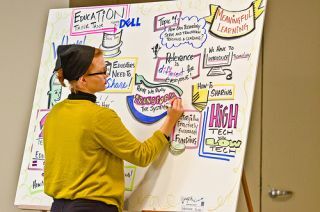 It's been a full week since the fabulous Dell Education #DoMoreEdu Think Tank in NYC. I'm finally getting around to posting my reflection. A small group of educators, principals, superintendents, IT administrators and community members all interested in and active in social media will come together in person to discuss possible topics such as the move from print to digital, data driven instruction, access to technology and an engaged community in and out of the classroom, learning and collaborating no matter the time of day or location, the benefits of social media in education and the notion of students having more influence over their own learning. I didn't know what to expect. This was Dell's event, even though it was held at Scholastic HQ. Would there be sales pitches? Focus groups? Mailing lists to sign up for? Product placement? The answers: no, no, no and no. There would be a series of questions, with conversation facilitated by Eric, and the essence captured graphically by Brenda (I believe) from Imagethink. Photos, Livestreaming and the social media presence were managed by Ryan and his Fit to Tweet colleagues. The whole thing would end up on Storify, too, live-blogged. All good stuff. Future #DoMoreEdu meetings should strive to "get the whole system in the room." Much was said at the meeting about the importance of social media both in the classroom with/for kids as well as professionally for ourselves educators. Still, I wonder. Why are there so few of us? Why are so many reluctant to embrace social media professionally? What are the implications of that reticence for educational reform? I am convinced there is some sort of psychographic explanation as to why certain people, like those in the room, gravitate to social media (and use it so effectively to learn and grow). But what about the rest of the world? Our colleagues? Those on the outside looking in? Let's face it. We are the minority. We are the few educators embracing these tools to advance our craft and improve education everywhere we can. But back in our districts and organizations, does it matter? Are there enough of us? As Scott McLeod likes to say, "Why aren't you having a bigger impact?" Why have these conversations if real progress and change is so unlikely? (See above.) Rather than give up, we should redouble our efforts to prosthelytize about social media in schools - both in classrooms and in teacher professional development. I'm fighting the good fight. Are you? Never underestimate the power of The Force (a.k.a. Social Media).